Touchless washing and pre-soaking are increasingly popular, delivering a thick, clinging foam of very small bubbles to soften dirt and slowly drag it away from the surface as the foam drips off your vehicle. To soften bugs, mud and salt deposits and road film, whilst not removing wax is the key and for this you need a non-TFR based foam. This new Pink snowfoam is just a little more fun. Race Glaze may not be first to market with this product but it is very cleverly formulated, highly concentrated (offering twice the dilution ratio of some other products) and PH neutral - did we say that again ? For enthusiast users with 1 or 2 cars, your 1 litre mixing bottle will do 3-4 cars before you need to add more concentrate. 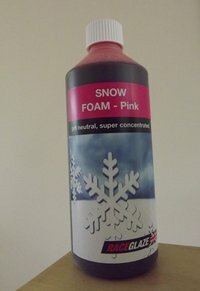 500ml of concentrate will foam around 30-40 cars ! You do not need to buy 5 litres ! Take care with the neat product as in this form it can stain hands and clothing.